The tragedy of Romeo and Juliet is the result of feuding between two noble families. Romeo and Juliet was set in 1594 in a town called Verona in Rome. The play contains a number of themes, including love, parents and social status. Both Romeo and Juliet's families are enemies, which make things difficult for them, as they have to keep their love a secret. If the secret were to be out it would result in further feuds. This suggests that the relationship between them and the parents was not that strong. Families these days tend to be closer than the families at the time of the late 1500s. Particularly wealthy families from the time when the play was set were not that close either. Juliet’s parents had arranged her to marry Paris who was a very wealthy man but Juliet had second thoughts and was brave enough to step up to her father. Children from noble families were often bought up by a wet nurse, whose job it was to breast feed their child and bring it up. This would make the child have a stronger bond with the nurse rather than the mother, as the child would spend more time with the nurse. This was the same for Juliet as she was not really close with her mother but she was closer to her wet nurse. The Capulets and Montagues were the strongest of enemies. This formed a barrier between Romeo and Juliet’s love because they were from those families. 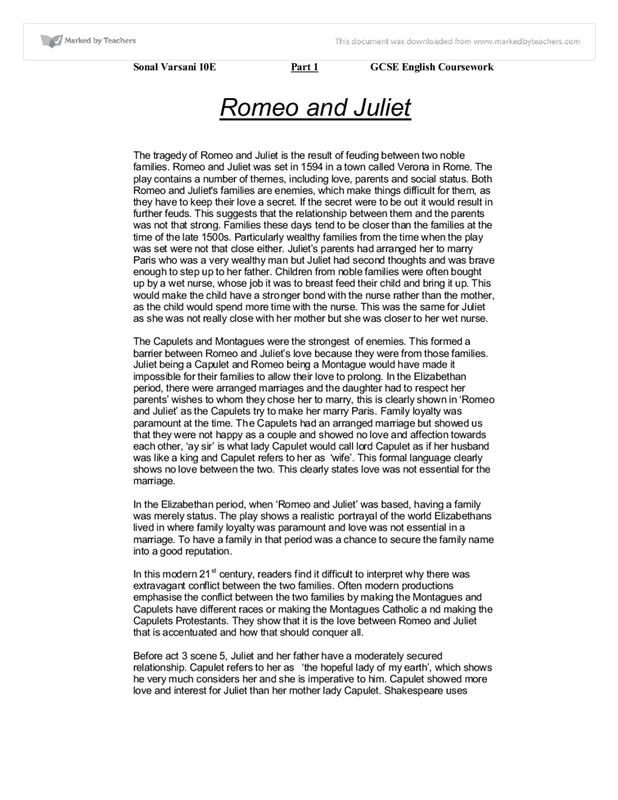 Juliet being a Capulet and Romeo being a Montague would have made it impossible for their families to allow their love to prolong. In the Elizabethan period, there were arranged marriages and the daughter had to respect her parents’ wishes to whom they chose her to marry, this is clearly shown in ‘Romeo and Juliet’ as the Capulets try to make her marry Paris. Family loyalty was paramount at the time. The Capulets had an arranged marriage but showed us that they were not happy as a couple and showed no love and affection towards each other, ‘ay sir’ is what lady Capulet would call lord Capulet as if her husband was like a king and Capulet refers to her as ‘wife’. This formal language clearly shows no love between the two. This clearly states love was not essential for the marriage. In the Elizabethan period, when ‘Romeo and Juliet’ was based, having a family was merely status. The play shows a realistic portrayal of the world Elizabethans lived in where family loyalty was paramount and love was not essential in a marriage. 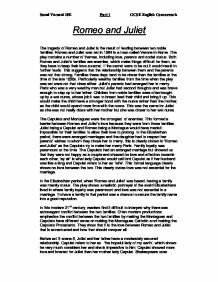 To have a family in that period was a chance to secure the family name into a good reputation. In this modern 21st century, readers find it difficult to interpret why there was extravagant conflict between the two families. Often modern productions emphasise the conflict between the two families by making the Montagues and Capulets have different races or making the Montagues Catholic and making the Capulets Protestants. They show that it is the love between Romeo and Juliet that is accentuated and how that should conquer all. Before act 3 scene 5, Juliet and her father have a moderately secured relationship. Capulet refers to her as ‘the hopeful lady of my earth’, which shows he very much considers her and she is imperative to him. Capulet showed more love and interest for Juliet than her mother lady Capulet. Shakespeare uses elaborate language by allowing Lord Capulet to recite little rhyming couplets while talking to or about Juliet. This shows Capulet’s expresses his love for Juliet by using poetry, as poetry in Shakespeare is often a sign of care and love. In act 1 scene 2, Capulet speaks in poetry while having a conversation with Paris about Juliet. But lord Capulet seems to care that Juliet might not be in favour of getting married instantly, ‘my child is a yet a stranger in the world’. He also shows us that he is not ready to let go of his precious daughter, ‘She is the hopeful lady of my earth’. If she leaves him fairly soon all his love is buried, as she is the only woman important to his life. Most fathers of wealthy families would not even consider their daughter’s opinion to having an arranged marriage but Capulet seems to care and knew Juliet would never disagree or deceive him at any time so he showed her the same respect. Unfortunately for Capulet, he had no idea Juliet was in love with Romeo and she was seeing him without permission. In act 3 scene 5 is when the relationship between Juliet and Capulet took a sharp change. Capulet’s vocabulary had soon changed for Juliet from ‘hopeful lady’ to ‘tallow-face’. This relationship changed because Juliet confronted to her furious father that she was not prepared to get married and that she was too adolescent. Capulet replied with a collection of abusive words and phrases such as: ‘mistress minion’ and ‘mumbling fool’. He threatened to leave her homeless, ‘and you be not, hang, beg, starve, die in the streets’ if she did not marry Paris on the following Thursday. Shakespeare uses this new language to show the deterioration between Juliet and her father has changed from using loving emotive words to violent negative words. Juliet then pleaded for help from her mother lady Capulet but she had even harsher words for Juliet than lord Capulet, ‘talk not to me for I will not speak a word, do as thou wilt, for I have than with thee’. But this was not that surprising as Juliet and her mother were no that close in the first place. This scene is one of the most dramatic sections in the play. It is the first time when lord Capulet neglects his daughter and her wishes. A modern reader would find this shocking for a father to behave in this manner to his daughter. However to an Elizabethan audience this would possibly appear as normal behaviour. The Elizabethans believed that daughters should respect their father no matter the situation. If daughters did not obey it would be acceptable for fathers to use extreme measures to control their daughter. Shakespeare makes lady Capulet seem like a very bitter woman even though she looks young and beautiful. As a consequence she acts wickedly due to the failure of her marriage. Shakespeare’s language tells us that lady Capulet’s relationship with her daughter Juliet is at best strained and formal. Juliet’s relationship with her mother is not at all attached as the relationship with her father at the beginning of the play. Shakespeare portrays Juliet and lady as completely different people; they do not fulfil the role as mother and daughter. Shakespeare shows this by using the language between Juliet and her mother in a strange way. Juliet always treats her mother like royalty, ‘Madame, I am here, what is your will’. Lady Capulet also talks to Juliet in strange way, ‘ho daughter, are you up’. Shakespeare uses formal language between the two, to show the tension and difficulty of their relationship. Lady Capulet has clearly shown in this play that she cannot stand having a private conversation with Juliet as she feels uncomfortable and she often invites the nurse with them because she feels threatened to be face to face with Juliet, ‘nurse give leave awhile, we must talk in secret. Nurse come back again, I have remember’d me, thou’s hear our counsel. Thou knowest my daughter’s of a pretty age’. In act 1 scene 3, lady Capulet tries to talk Juliet into marrying Paris Juliet by telling her what her life would be like if she did, ‘to beautify him, only lacks a cover’. She was not successful but the nurse eases the tension down for Juliet by referring to sexual humour, ‘no less, nay bigger women grow by men’. Lady Capulet reacts and talks to the nurse as if she knows more about Juliet than her, ‘she’s not fourteen’. Juliet hardly called lady Capulet mother as she thought of the nurse more of a mother figure to her because the nurse actually treasured her unlike her real mother lady Capulet who seems like she does not want to know her. Although the nurse is not in fact related or a parent of Juliet, she clearly acts like family and fulfils the role of a parent for Juliet. Juliet’s relationship with the nurse is closer than the relationship between her and the Capulets. In the fifteenth century upper class woman often hired lower class woman who had just lost a child to wet nurse their babies: therefore the nurse played the part of a mother for Juliet from an early age and we can see they have developed a very close relationship. Shakespeare shows this by using affectionate language, which comes across in treatment of Juliet. The nurse uses nicknames and affectionate terms for Juliet: ‘jule’, ‘lady bird’ and ‘lamb’. These words contrast greatly with the more formal term of ‘my daughter’ used by Juliet’s mother. Act 2 scene 5 shows us how devoted the relationship between the nurse and Juliet is: ‘now good sweet nurse, o lord, why look’st thou sad’ and ‘o god’s lady dear’. This shows us that the nurse fulfills the role of a mother as they talk to each other as if they really are mother and daughter. In Baz Luhrmann’s version of Romeo and Juliet, he portrays this difference by making the relationship between the nurse and Juliet very tactile, whilst the mother is preoccupied with her own dress. Her mother also delivers the message that she is to marry Paris and then leaves: ‘thus then in brief, / the valiant Paris seeks you for his love’; it is the nurse who comforts Juliet and wishes her joy ‘seek happy nights to happy days’. The sexual reference shows how comfortable at ease she is with Juliet, whereas her mother’s formal sonnet focuses on the more material aspect of the relationship she is about to form. Romeo is not seen with his parents in this play because he scarcely has a relationship with them. Romeo rarely talks to his parents as ‘he his own affections counsellor’ has nothing to share with his parents. Montague is very worried about Romeo an the start of the play, this is shown in the play by several phrases such as: ‘adding to clouds, more clouds with his deep sighs’ and ‘away from light steals home my heavy son’. This is showing Montague is very caring towards his son and is scared of what he is going through. Montague also comments on his and Romeo’s relationship, ‘but to himself so secret and so close, So far from sounding and discovery’. This shows us Romeo’s relationship with his parents was not that close. Romeo is upset at the beginning of the play because his first love Rosaline (Juliet’s cousin) declared she never wanted to get married. This made Romeo go through a period of depression writing all his thoughts and feelings in his poetry, ‘o she is rich in beauty, only poor’ and ‘that when she dies, with beauty dies her store’. This romantic language showed how much love he had for Rosaline. But later on in act 1 scene 5 at the Capulet’s mansion Romeo meets someone else who is called Juliet. It was love at first sight for both Romeo and Juliet. Romeo soon finds out Juliet is a Capulet but this does not hold him back from pursuing his love for Juliet. This tells us that he does not care about his parents’ authority and that he is so in love with Juliet that it does not matter he breaks his parents’ commandment. Romeo goes to see friar Laurence in act 2 scene 3 because he wants to inform him about his new love, Juliet. Romeo often visits him as he hardly speaks to his father and sees the friar of more of a father, ‘good morrow father’. At the same time the friar thinks of Romeo as his own son, ‘that’s my good son’. Following the banishment of Romeo in act 3 scene 3, friar Laurence’s role is becoming more of a concerned parent helping with Romeo’s banishment. He tries to stop Romeo from committing suicide, ‘hold thy desperate hand’. He also stops Romeo from staying in Verona, as he will be killed, ‘go hence, good night, and here stands all your state’. The ending of ‘Romeo and Juliet’ is extremely tragic and dramatic. Act 5 scene 3 is when ‘the star-crossed lovers’ die for each other’s love. Romeo has poisoned himself and Juliet has stabbed herself. Romeo’s parents are so devastated that lady Montague has died from grief and lord Montague is even more distressed from dealing with two deaths. The Capulets however seem less miserable but their relationship still remains distance. The Capulets and Montagues were not the perfect role models for both Romeo and Juliet. They did not exactly fulfill the role of parents for Romeo and Juliet but the nurse and friar did. Neither Romeo nor Juliet was close to their parents but were close to the friar and the nurse. These relationships influence this story so much that the story would not have been as effective with all these eccentric relationships. And without these strong enemies Romeo and Juliet’s love would not be challenging at all, which would make this dramatic story monotonous because this is the main plot of the play. Romeo and Juliet actions were acceptable as they died for each other for their love. They knew they could not be together if one of them died so they both died together in love and this way proved they were together for life. The moral Shakespeare is trying to express in the play is that family relationships are essential for a contented life. How Shakespeare presents Romeo &amp;amp; Juliet's early relationship. Love and Conflict in Romeo And Juliet. Committed to her marriage and dedicated to her love, Juliet takes her own life when she realizes Romeo is gone. This against the other people stands out as everyone else has dull, bland and ordinary colours clothes (for that period in time has) such as cream and brown shades. This is done on purpose so that they aren't taken notice to by people watching as not to distract them from the important characters. Shakespeare uses a concoction of romantic and poetic language, using comparisons and imagery throughout the sonnet. Romeo & Juliet then find out that they are enemies. Shakespeare is putting this strain on their relationship to remind you of the hate of the families, straight after they have just fallen in love with each other. Romeo see Juliet and say "snowy dove trooping with crows" (act 1 scene 5) this tells us that romeo thinks that Juliet stands out from every other person. Tybalt hear Romeos voice and he know romeo is not meant to be at the Capulet party. Juliet is saying that she loves her enemy she know this information to late she loves him already. She says this while walking up the steers to talk to her mother. The nurse heard her say this so Juliet said when the nurse asked what she was saying Juliet says.